The fast, easy way to keep employees' training records organized and accurate. With Keller-Soft® E-Z Access Recordkeeper software, you can organize and track all aspects of OSHA, DOT, and EPA training ... from who's been trained and when, to which training topics were covered. You'll also save time on data entry and file maintenance. With other programs, you have to go into individual employee records to record training data. 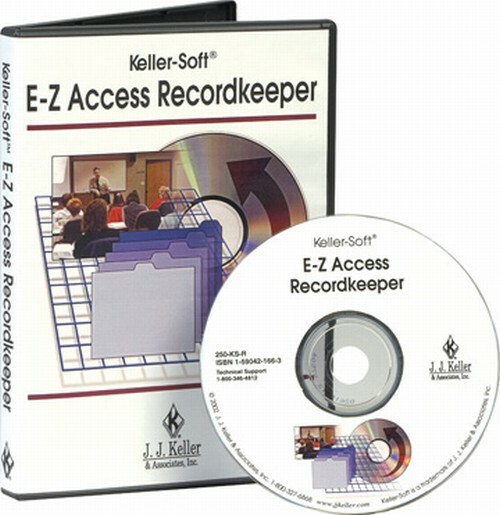 The E-Z Access Recordkeeper automatically populates employee records when you enter the list of training attendees by topic. Preformatted topic areas - Keep records on more than 100 safety, regulatory, and general training topics and help determine what training needs to be done. Flexible customization capabilities - Document company-specific info by adding additional fields such as employee anniversary dates, vacation days, accidents, and more. Reporting Function - Generate professional-looking reports. Training notification option - Set up onscreen and email reminders to alert you of upcoming training needs. Pentium III class or higher processor. Windows XP, Vista (32- and 64-bit), and Windows 7 (32- and 64-bit) operating system. Minimum 256 MB RAM to operate. Video with resolution at least 800 x 600 (small fonts), 16-bit color.